Halloween means fun for all ages! In the United States and in many other countries, Halloween is celebrated on the last day of October. You might not associate this fun, festive day of ghosts and goblins with flowers, but it's actually a wonderful time to send Halloween gift baskets to loved ones. Your seasonal gift will surely be appreciated! During the Halloween season, kids are excited for candy, costumes, and trick-or-treating. Halloween flower arrangements can be a great way to help you commemorate the hard work of all the people who help make the day special for kids! For example, Halloween floral arrangements might be a good idea for young parents, teachers, and just about anyone else who works with children. 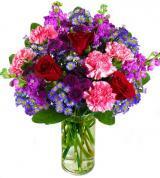 Give someone you know a spectacular gift they won't soon forget! When the sun starts to set on Halloween night, kids hit the streets with visions of full Halloween candy baskets in their heads. But Halloween doesn't have to be just for the kids. Why not surprise some of the trick-or-treating chaperones with Halloween gift baskets that will appeal to a wide range of tastes? 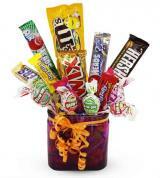 Here at Avas Flowers, some of our most popular baskets include flowers, fruit, and, yes, even candy! 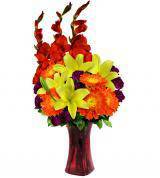 Halloween flower arrangements can also be a great way to add a pop of color to the home or the outside area at Halloween time. Sure, flowers may not be "creepy," but there are many beautiful flowers that come in fall colors. 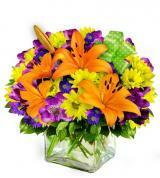 There are flowers that come in colors that are associated with Halloween, like orange, yellow, and even black. 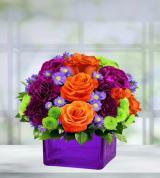 Ladies love Halloween floral arrangements, especially when they are a surprise. 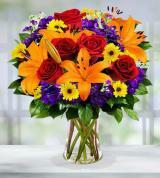 Our Floral Experts are always on hand to help you select just the right gift for any occasion.